Curious George birthday party ideas for kids that will easily help plan your next party. 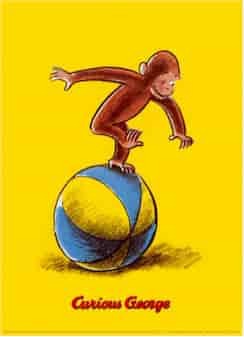 Ideas for fun party games, activities, favors, food and goody bags that are taken from some of the most loved Curious George books. The Curious George party theme is great for kids of all ages! Banana invitation - Send party information written in permanent marker on a plastic banana. Puzzle invitation - (Curious George Goes to the Hospital) Buy blank pre-cut puzzles (at craft stores) and write party information on them. Make sure to leave one of the pieces blank. Send all of the pieces *except the blank one* out to guests for the invitation. Save the blank piece and use it as a thank you note. Wrap it up like the nurse did at the end of the story. Yellow with blue and red accents - yellow table cloth with red helium balloons or Jungle theme with raffia skirts on the tables and jungle vines. Place large yellow hats (straw sun hats will work) upside down on the party table and place containers of snack food inside. If using helium balloons tie them to bunches of bananas on the party table. Hang kites around the room (from the book Curious George Flies a Kite). Make a Happy Birthday Banner using pictures of the letters from the book Curious George Learns the Alphabet. Print or draw the letters for the banner and color them. Glue or tape to heavy weight cardstock or paper plates in bright colors (alternate yellow, blue and red). Punch holes in the sides of each paper or plate close to the edge. Tie the letters together in order with curling ribbon and hang in party area. Bounce House - Rent a jungle theme bounce house. Choose a banana, monkey or jungle themed piñata. Directions for having a piñata at a birthday party. (from Curious George Learns the Alphabet) Print out copies of the first letter of the guests names using a very large font. Give the guests crayons and markers and ask them to make an animal out of the first letter of their name. Create a puzzle station where children can put together puzzles. (From Curious George Goes to the Hospital). Turn this into a relay race game by dividing children into two teams and one by one they have to try and put 1 piece of the puzzle together. Then they run back to their team and the next person goes. Put on a puppet show - (from Curious George Goes to the Hospital) Let the children make puppets from socks or paper bags. Pre-cut eyes, noses, ears and mouths out of paper (for paper bag puppets) or felt (for sock puppets). Then let the children sit behind a covered table and put on a puppet show for the adults. This is a fun relay race to play outside in the summer - caution ... kids can get wet! You need two large tubs filled with water (add some dishwashing soap to make bubbles) and 2 smaller containers which are equal in size. The idea is to get water from the larger containers, run across an area (more then 20 feet) and dump it inside the smaller containers. The team which fills their own container first wins. There are several ways to do this - you can transfer the water using spoons, sponges or, our personal favorite, plastic cups that have holes punched in the bottom. Divide guests into two teams and have them line up behind one another. One at a time they take their "water carrier" and get water from the big bucket - run across the play area and then put the water into the smaller container. Then they run back to hand off so the next player on their team. This continues until one team's container is filled up - or to a pre-determined mark. Curious George breaks his leg and has to get a cast in the book Takes a Job. For this game party guests will be wrapping up each others legs using rolls of toilet paper for casts. Divide party guests into teams of 2. Give each team a roll of toilet paper (make sure they are small rolls - not the double ones!) and tell them that they need to fix their partners "broken leg". They will roll the toilet paper around their partners leg to resemble a cast. First team done with using all the toilet paper on their roll first wins. Play again switching places so everyone gets a turn. This is a fun game that gets little monkeys moving and having fun! Ask children to form a circle around the birthday child - they become the monkey in the middle. To someone in the big circle give a small ball, sock monkey or plastic banana. The kids in the circle throw the ball over the head of the inside monkey to a child on the opposite side of the circle. The "monkey" tries to catch the ball as it is thrown over their head. If the monkey in the middle catches the ball then they go to the outside circle and the child who threw the ball that was caught by the monkey becomes the new monkey in the middle. Roll up several newspapers tightly and secure with rubber bands. Set out different containers or targets for the children to try and hit with the newspapers. New garbage cans, hula hoops, laundry baskets or tubs work great. Put points on each target and give the guests several chances to throw the newspapers and gain points. 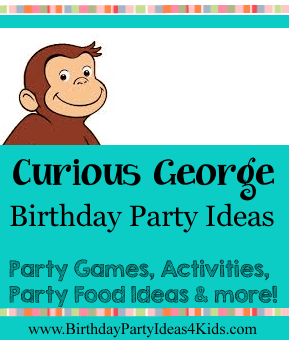 For more fun Curious George party ideas see our Monkey themed birthday party page. More games, activities and fun ideas!